Have you considered a Heat Pump Condenser Dryer instead of a standard Condenser Dryer - the energy savings to be made can be quite incredible. 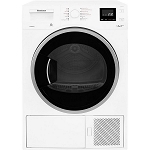 Tumble dryers have generally not been terribly energy efficient and have tended to be used sparingly by households - however as life becomes busier and we have less time to "peg out", tumble dryers are becoming a necessity. 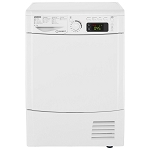 Some electric condenser tumble dryers now come heat pumps - a relatively new technology that dramatically reduces how much it costs to run compared to a standard condenser dryer. The job of the heat pump is to reheat the air that's circulating within the dryer. After hot air has passed through the drum, absorbing moisture from your clothes, it passes through filters where the air is partly cooled and moisture is removed from the air.. Meanwhile the warm air is re-heated and circulated back to the drum. The reuse of hot air means energy is kept within the machine instead of being allowed to escape. 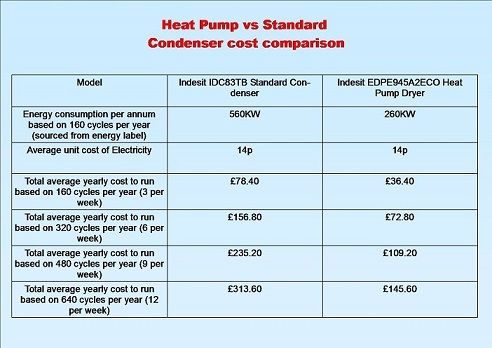 Below is a table, showing the average cost per annum of a heat pump condenser compared to a same brand condenser variant.